Our Pond-Less Fountain Sets are designed to be adaptable and space efficient. Made to be customizable with our wide range of fountain nozzles and lighting sets. Water Garden Ltd offer an exclusive range of pondless fountains which provide a decorative water display without the need for frequent maintenance or the safety concerns of an open water pond. 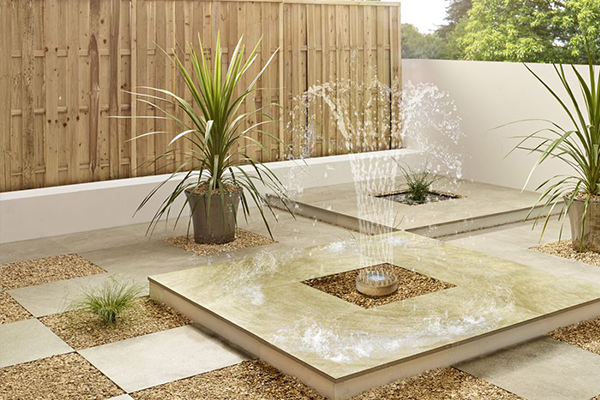 Our pond-less fountain kits are simple to install in a garden or patio area and are easily customised with a wide range of decorative water nozzles, lighting options and Smart controls. The above selection of pondless fountain kits are just a taster of what can be achieved. Water Garden can create a range of customised fountains using our full range of Decorative Fountain Nozzles, impressive Spray Rings and our exclusive Fountain Spray Bars. For larger water displays we are able to utilise pumps which offer dancing water capabilities to create wonderful, dynamic effects, all without the need to construct an open water reservoir or pond. Our dancing fountain pumps can be controlled by your mobile phone or tablet and Illumination of the water displays can also be controlled in the same way. Our services are not just limited to pondless fountains – we can also help you create pond-less waterfalls, streams and cascades without the concerns over child safety which open water may present. The possibilities are virtually endless, so get in touch with our team of experts to help you create the fountain or feature you’ve been dreaming of.